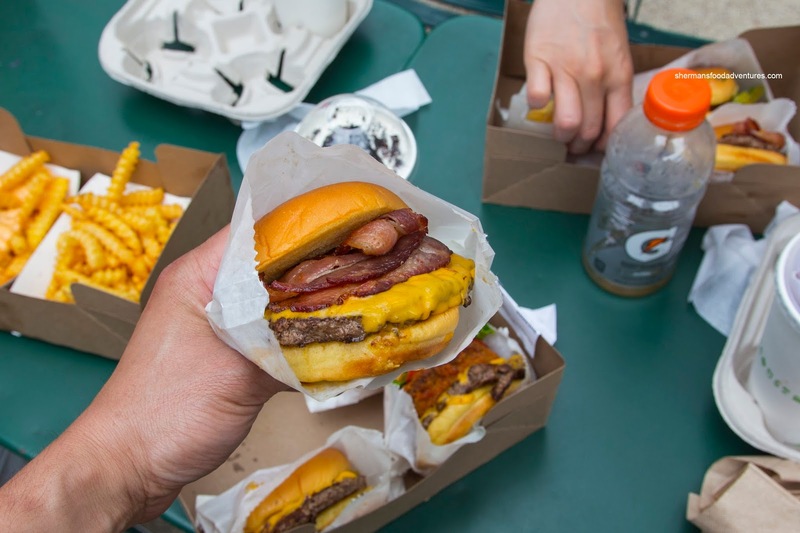 For the kiddies, I got them one each of the Shack Burger with cheese and Shack Burger with bacon and cheese. These were decent in size but hardly large - perfect for them. The most noticeable thing about the burger was actually the soft, "conforming-to-the-ingredients" bun. 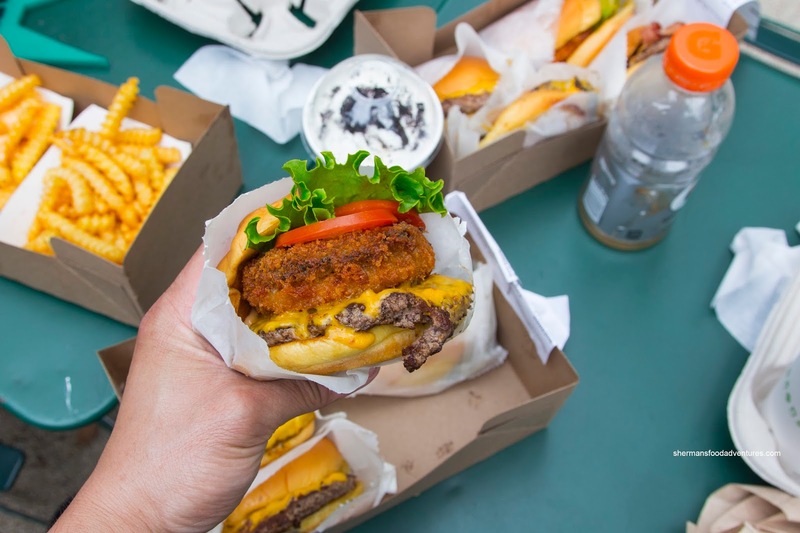 This is actually an important feature of a good burger since a hard bun means all of your ingredients fall out with every chew and overly soft means everything will fall apart. 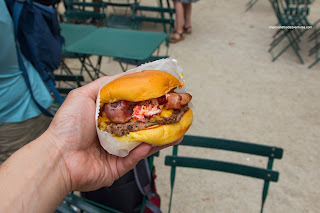 Second, the burger patty was moist, a bit crumbly and appealingly meat-tasting. Add in some meaty bacon and salty cheese, the whole thing was delicious! The kids agreed as they dusted them off. For myself, I had the Shake Stack which was a cheeseburger topped with a breaded portobello mushroom and the usual lettuce, tomato and condiments. 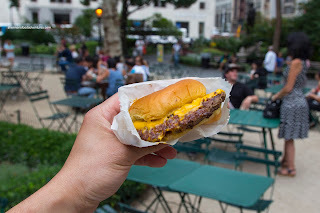 This was really good with the same qualities as the cheeseburger except with more textures including the cold crisp lettuce and the crunch of the buttery and Earthy mushroom as well as the creamy muenster cheese. However, my favourite burger of the bunch was the Smoke Shack which again was a cheeseburger with applewood smoked bacon and chopped red cherry pepper. The red pepper was the star of this burger adding a noticeable and tasty sweetness to the savory burger. Every bite was a burst of flavor. Viv had the Chick'n Shack featuring a whole fried chicken breast. This was also very good where the chicken was tender and moist while the outside sported a light, yet crunchy batter. 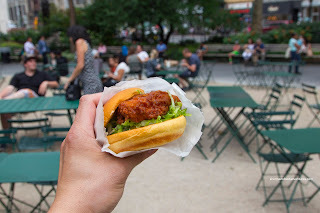 The whole thing was flavorful on its own, but the addition of creamy buttermilk herb mayo added a mild flavor to the sandwich. 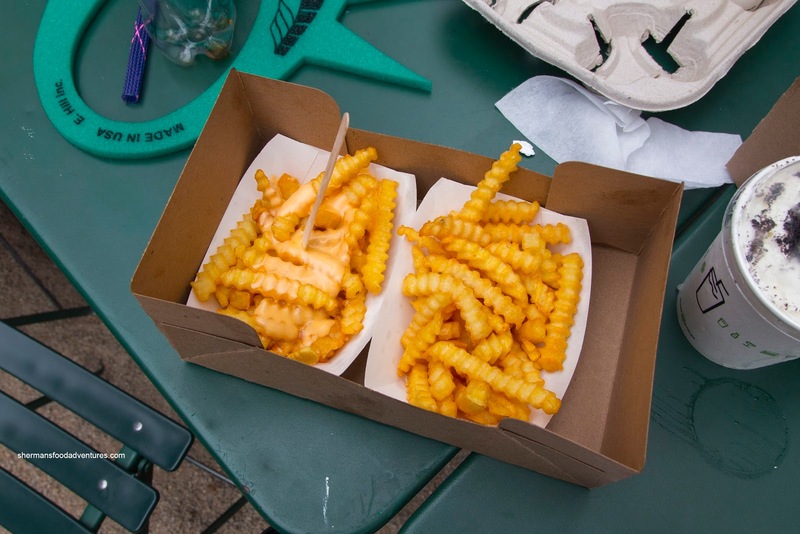 On the side, we had one each of the Fries and Cheese Fries. Nothing particularly interesting other than the fact they were crinkle-cut and really crunchy (almost like crisps). 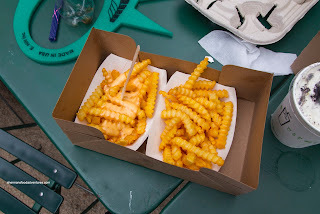 I found the cheese fries to be nothing more than melted American cheese on crunchy fries. At the very least, the fries held up to the moisture. My son went for the Cookies n' Cream Shake (not pictured) and it was definitely creamy and rich. However, it was also very drinkable. Of course the flavor choice meant it was sweet and somewhat chocolatey from the bits of cookie. Even though it was sweet, it wasn't overbearing. 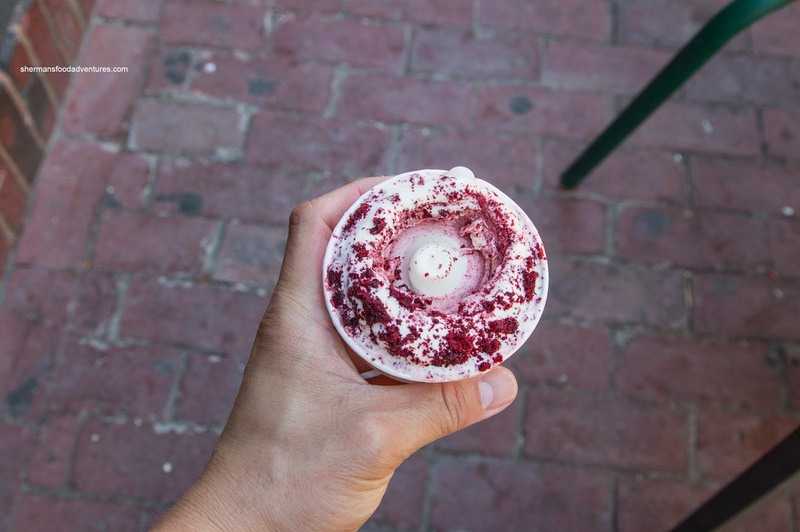 On my visit to Boston, I was able to grab a Red Velvet Concrete which was also thick and firmly creamy. It was pretty sweet, but tolerable while spiked with the extra sweetness of red velvet cake. 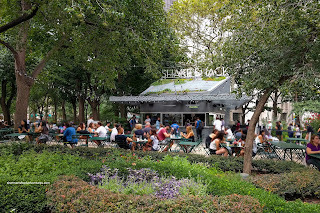 So was a chain burger joint worth sacrificing a meal in NYC? Absolutely. The burgers were on point and satisfying while the frozen custard treats were sinfully rich.